All current pre-orders have been fulfilled. Designed to be the premium personalized charging experience for Apple Watch, iPhone, and AirPod owners. Base Station Apple Watch integrates a sleek, modern design with a functional wireless charging hub. With 3 high-power charging coils and a built-in Apple Watch charger, Base Station Apple Watch creates a frictionless charging experience. Can Base Station wirelessly charge my AirPods? Does Base Station Apple Watch Edition come with an Apple Watch Charger? Yes, there is a fully integrated Apple MFi-certified Magnetic Apple Watch charger. How many devices can Base Station Apple Watch charge? Base Station can charge up to 3 devices at once, but it is designed to comfortably charge 1 Apple Watch and 1 phone simultaneously. Can Base Station wirelessly charge my Apple Watch? Easily charge your AirPods, Apple Watch, and iPhone wirelessly. We've added three coils to provide multiple charging orientations; center your phone over a coil and wirelessly charge your phone how you like. Great for your desk, bedside, and around the house. Housed in a precision-molded, aircraft grade aluminum body with a gunmetal gray finish. Compatible with nightstand mode to easily see the time, date, and your alarm at a glance. We took the time to build Base Station Apple Watch to be as thin as possible while allowing you to interact with Nightstand Mode by tapping your nightstand. We have meticulously designed Base Station Apple Watch for aesthetics and convenience. 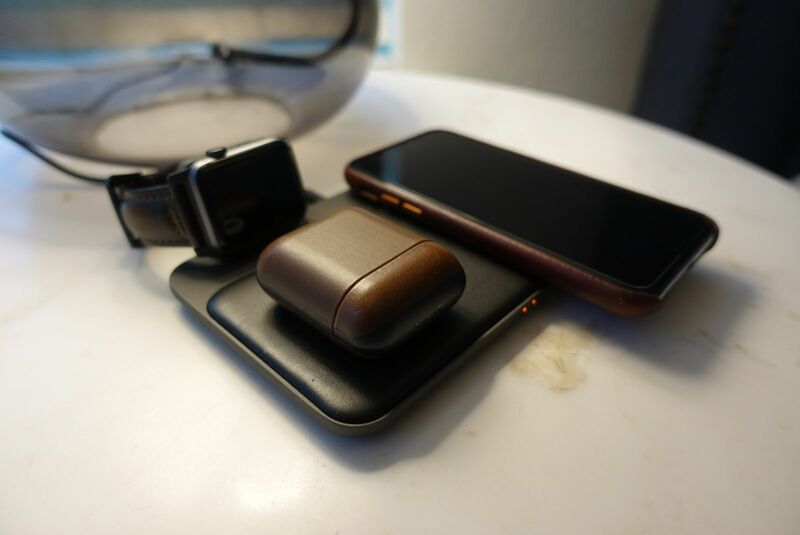 With 3 coils, we enable multiple charging orientations for your phone, AirPods with Wireless Charging Case, and your Apple Watch for simultaneous charging. Best charging station. Slim profile, cushion for the apple watch so it doesn't scratch, and airpods charge even with the Nomad leather case on. Sung Joong K. Reviewed by Sung Joong K.
Needless to say many words. Buy one. You won't regret it.